Our new Exploratory Data Analysis in R: Case Study course is now available! We recently launched a new course, Exploratory Data Analysis in R: Case Study taught by David Robinson. Dave is a Data Scientist at Stack Overflow and his interests include statistics, data analysis, education, and programming in R. In his course, you'll explore the historical voting of the United Nations General Assembly, including analyzing differences in voting between countries, across time, and among international issues. In the process you'll gain more practice with the dplyr and ggplot2 packages, learn about the broom package for tidying model output, and experience the kind of start-to-finish exploratory analysis common in data science. Ready to start? Exploratory Data Analysis in R: Case Study features 58 interactive exercises that combine high-quality video, in-browser coding, and gamification for an engaging learning experience that will immerse you in Exploratory Data Analysis. 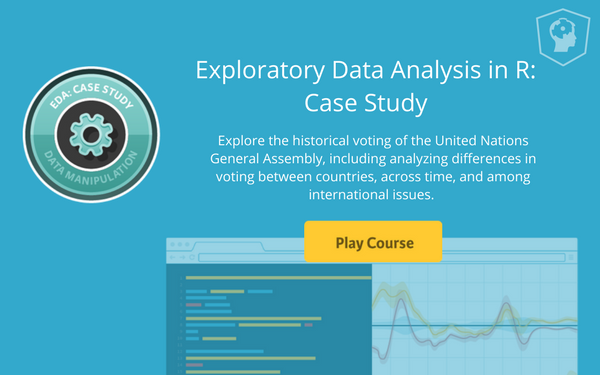 In the first chapter, you'll learn how to clean and filter the United Nations voting dataset using the dplyr package, and how to summarize it into smaller, interpretable units. Once you've cleaned and summarized data, you'll want to visualize them to understand trends and extract insights. In the next chapter, you'll use the ggplot2 package to explore trends in United Nations voting within each country over time. While visualization helps you understand one country at a time, statistical modeling lets you quantify trends across many countries and interpret them together. In the third chapter, you'll learn to use the tidyr, purrr, and broom packages to fit linear models to each country, and understand and compare their outputs. In the final chapter, you'll learn to combine multiple related datasets, such as incorporating information about each resolution's topic into your vote analysis. You'll also learn how to turn untidy data into tidy data, and see how tidy data can guide your exploration of topics and countries over time.